Posted by Chiko on August 6, 2011 . Leave a comment. My weeks run longer than mere mortals. 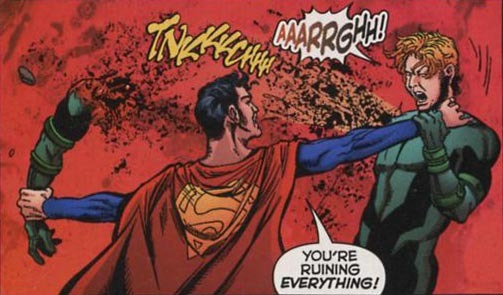 With that said, here’s the 2nd installment of Superboy-Prime’s Quote of the Week. 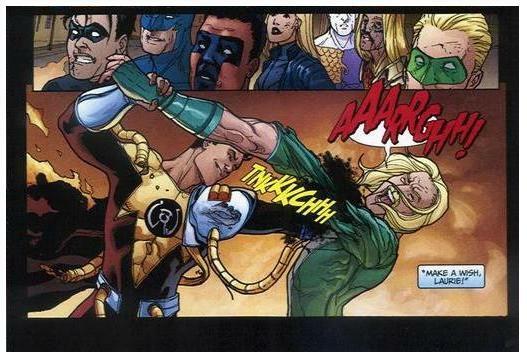 In Infinite Crisis #4, Superboy-Prime fought against Superboy and the Teen Titans. Unfortunately for everyone (including Prime himself), they didn’t quite realize how powerful he was. He accidentally decapitated someone, punched a hole through someone’s else stomach, and froze someone to death. Realizing he was killing, he immediately blamed the folks he’s killing. Poor Risk lost an arm for it. In fact, here’s a bonus quote! In Tales of the Sinestro Corps: Superman-Prime #1, Risk joins others in fighting Superman-Prime. This led to Prime ripping off Risk’s other arm! A hilarious moment in comic book history.